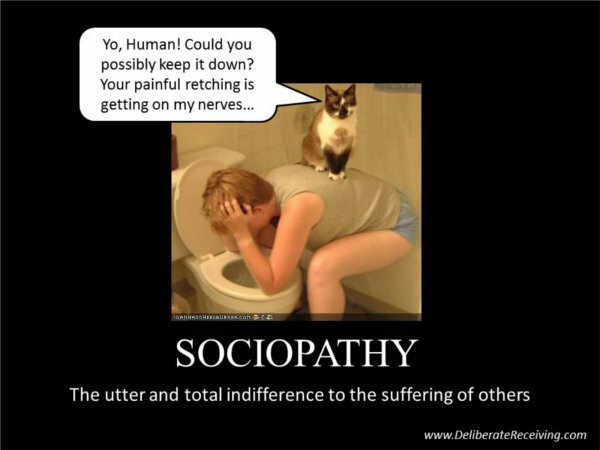 Have you ever wished you were a sociopath? I gotta be honest: I have. I mean, how can it be that I carry around guilt for everything I’ve ever done, while there are people in this world who worry about nothing! What a sweet life! I could take any job out there and not worry if I’m making the world a better place by being there. I could buy stuff without first reading the label. And these animals? Oh, why would I worry about animals? Let them worry about themselves. I could treat others abysmally. I could tell them whatever I wanted. I could be sneaky and subversive and start lots of drama, then sit back and watch the show. But the best part? People would love me. They’d hang on to my every word. They’d think I was a god. They’d want to sleep with me and give me money. Oh, how we worship the soulless among us! There’s no end to all the things I could do if only I could make this stinky, lousy conscience shut up. I used to think that what I really wanted was beauty, power, and wealth. But the older I get, the more I realize that those things are served best by those who lack conscience. I mean, who wants to end up a drug addict or recluse because the pressure was so great? No, what I really wanted was a lack of conscience. Yet, truth be told, most of the time I’m glad I have one. It’s the best thing going for me. I just wish most of the rest of the humans on the planet valued theirs as well. « Organic Chicken? It’s Not Necessarily Humane. I often wonder how other people sleep soundly while I lay awake worrying about the world?! So do I. But I’m sure they don’t give me a single thought. Jen, what a beautiful post. I look forward each day to this blog, it either brings me joy or inspires me to be a better person. Your soul is beautiful and of great value, and has the power to change the world, one life at a time.Rumpydog reinforces to me that every living critter has a soul. I wish you blessings today and always. Because you are a blessing. I read the book The Sociopath Next Door, very interesting read. I too wished I had that deficiency while I was reading it, but also like you, I decided the pain of the conscience is worth it, because I too wish we all had one. The books concluded that we live in a society that actually rewards people who do not have one or can act like they do, and that is just sad. I learned this when I worked in prison. Guess who got the most mail, the most visits, and always has money in their account? Wow, this is a departure. For your edification, you should know that the DSM no longer uses the definitions, pyschopath and sociopath. The newer accepted terms are “Antisocial Personality Disorder,Types I and II,” respectively. I do get your sarcasm, but I think we both know that going through life with either form of APD must be sad and tragic. These people – Type II – never know love, friendship or any of the emotions shared by so called decent people. They can’t appreciate art or enjoy literature. Everything in their lives is a means to an end. Any relationships they develop are strictly for a perceived benefit. I myself, feel kind of sorry for the Ted Bundys, the John Wayne Gacys and the Albert Fishes of this world. Are they vicious killers who deserve the electric chair? Of course. Do their victims suffer horribly at their hands? Absolutely. But I can’t imagine living in a world populated by people, and yet being utterly and completely alone. The people that do come in and out of their lives, are merely possessions – with no more meaning to them than an electric shaver or a microwave oven – something that serves a momentary purpose and is then thrown away. And no sociopath could have Rumpy. They may own animals, but they can’t love them or accept love from them. And sadly, they often hone their victimization skills on their animals – and the animals of others – before moving on to Human prey. No, sociopaths (Type II APD) are sad and pathetic creatures. And of course, I mentioned those famous cases that we think of as extreme, but they are the real sociopaths. We toss around psych terms, far too loosely. “Oh, my wife yelled at me this morning. She’s such a schizophrenic.” If we knew any real schizophrenics, we’d be far less likely to bandy the term about. Ayn Rand had some political beliefs that I consider callous and unfeeling. She was not a sociopath. Ed Gein was. I think you missed my point. 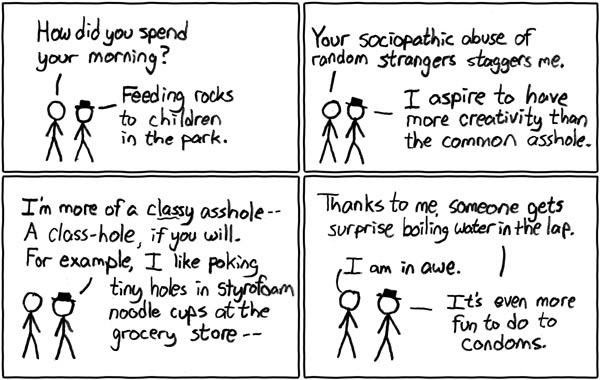 I was really poking fun at those who seem fascinated with sociopaths- those who stand up for them, if you will. It’s the little things that make you a gift to the world. It shows in what you do for love (a Chorus Line) and in what you do for others. Most of all it shows what you don’t do TO others. Rumpy and the others are with you because you have a conscience. If you didn’t, he might still be wondering on the road. Thank you for that. I wish sometimes I could not care – when I try, I get this stiffness in my body that tells me something is not right. More importantly, I don’t want to put them on pedestals. I sometimes wish bad things wouldn’t bring me so down and I could fall in hibernation and when I wake up, all problems are solved. But at the end I’m rather me with all the mistakes and with my conscience what steals my sleep. Thanks for a great post. btw: class-hole is a good word to describe some people. People like that certainly do boggle your mind that’s for sure! And BTW i’m sorry but I had to laugh at that little comic pic when it said “a class hole, if you will” haha!!! That was funny! You’re so sweet and warmhearted lady, Jen. Nope. Never wished for that one. I sometimes worry I don’t have enough of a conscience. Why don’t I do more, why do I care more about the animals than the people? I don’t know, but I would say unequivocally that you are NOT a sociopath. There are, of course, plenty of humans with no soul lumbering among us. It’s odd that religious types claim animals don’t have souls. Yet, I believe animals very possibly could have souls, especially dogs, because they’re ultimately more compassionate and honest than most humans. I happen to agree with you on that one! Dear insensitive people of the world, teach me how to be more like you so I could defend myself against people like you.